Spring always seems to take forever to arrive here in the Pacific Northwest, but when it does, it comes with breathtaking speed. You go along for seemingly endless days and weeks of frosty rooftops and mere glimpses of the sun, and then suddenly the cherry trees are blooming! Given the weather extremes that many people in various parts of the country have experienced this winter, I can hardly complain. The winter of 2014-15 was exceptionally mild in my part of the world: much warmer than any of the dozen-plus winters that I’ve experienced here. While I’ve enjoyed the opportunities to get outside and be active, the snowpack in the Olympics is now at something like 10% of normal. This doesn’t bode well for our summer water supply, as we have no reservoirs but rely on snow-melt as our water source. Yet no matter how mild the winter, every year by the time early March rolls around I am more than ready for spring to arrive. As the days start getting noticeably longer, I begin to search eagerly for the subtle signs of approaching spring. As the sun begins to swing northward, the light changes. It seems more luminous, shimmery — even on a cloudy day. March brings unsettled weather — showers and sunbreaks instead of ceaseless drizzle. On the afternoon of St. Patrick’s Day, as we were walking downtown in search of appropriate libations, we were rewarded with a stunning full double rainbow. I decided I wouldn’t try to capture its scale with my phone camera, but when it produced THIS visual effect I had to photograph it. 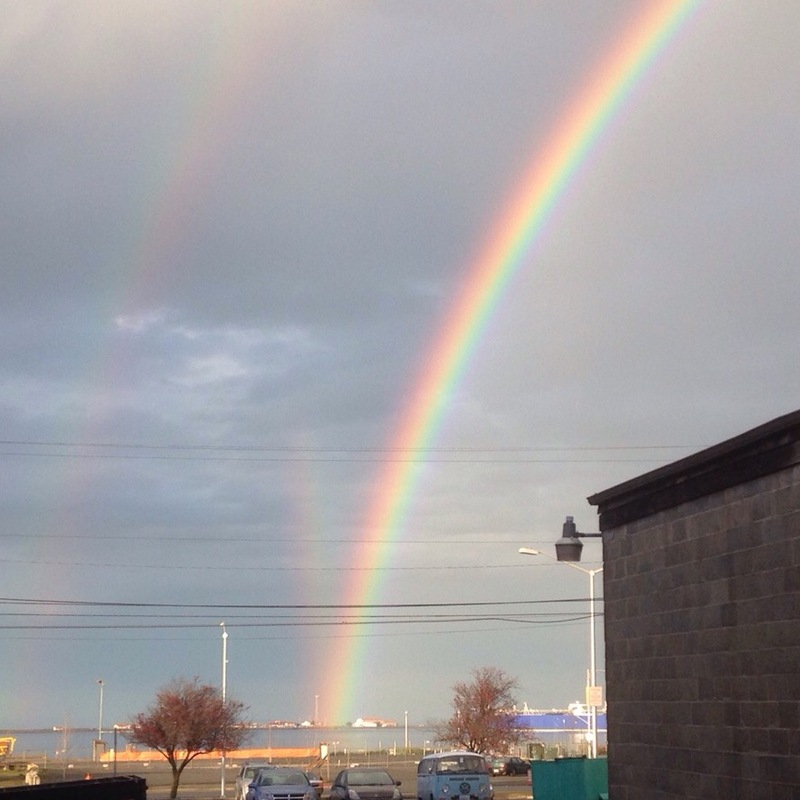 A double rainbow with a checkmark — surely there is a pot of gold at the end of this one! The best I can figure is, this must have been a reflection of the rainbow, straight up out of the water. 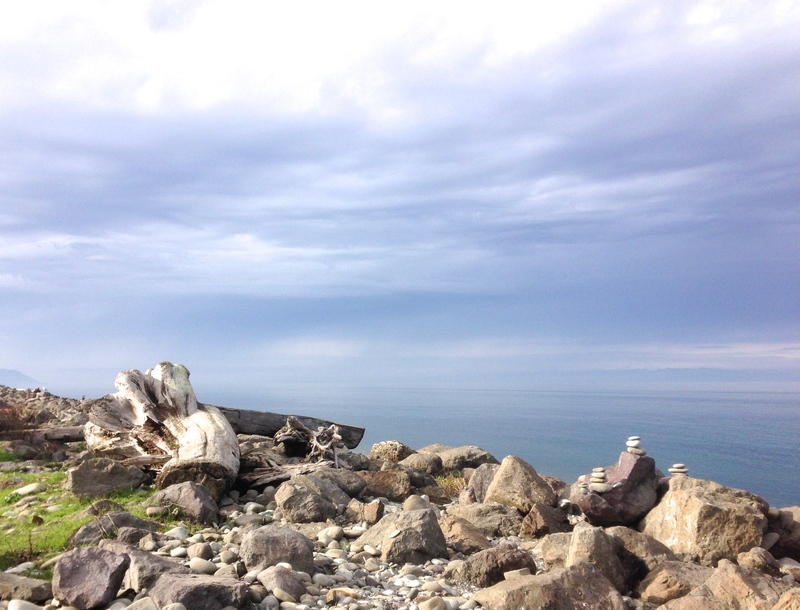 Last Friday, shortly before the arrival of the Vernal Equinox at 3:45 Pacific time, I went out for a long walk along our waterfront trail. 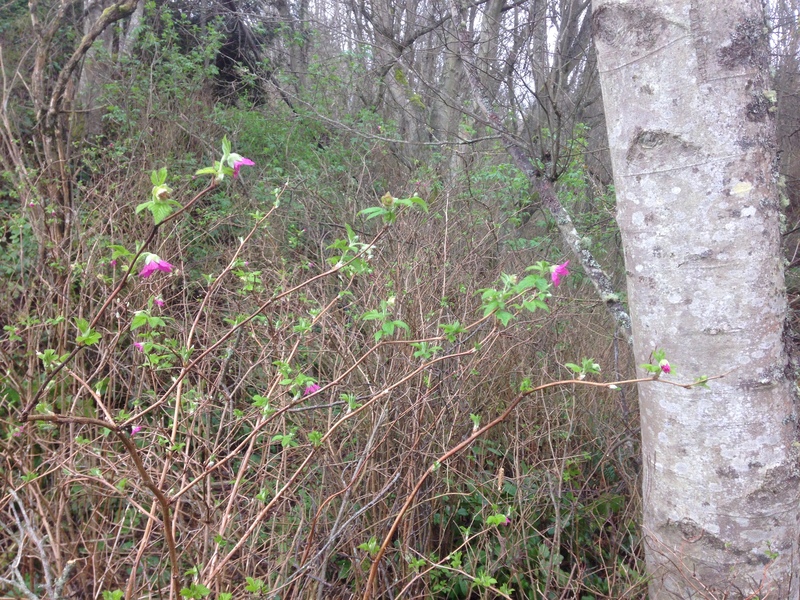 The salmonberries actually began blooming a couple of weeks ago, but just before 3:45 I came across this nice patch and had to stop and capture them at the moment the northern hemisphere crossed into spring. 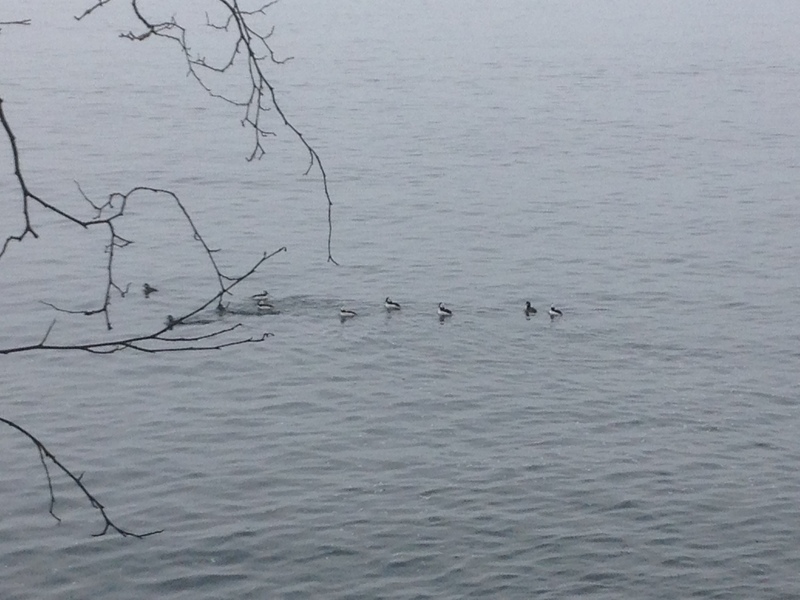 Just moments later I came upon this small flock of buffleheads. Mating season has begun! The six males (black and white) were jockeying for position and intently following the three females (dark). A bit later I encountered this little guy who’d ventured out for a spring walk. 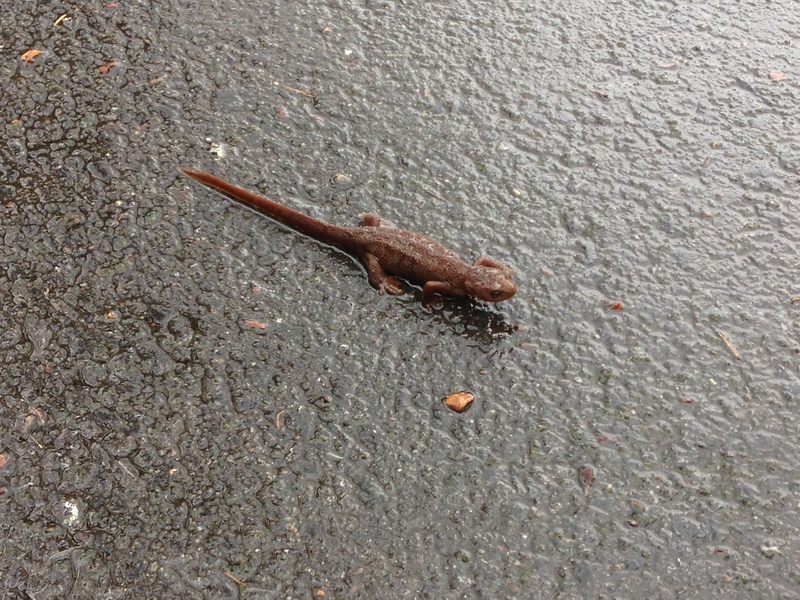 I believe this is a rough-skinned newt. Lest you think all is rosy out there, this is the time of year when I can never take the Olympic Discovery Trail for granted. This winter’s rains (being of the downpour variety rather than the usual steady mist) have really taken their toll. 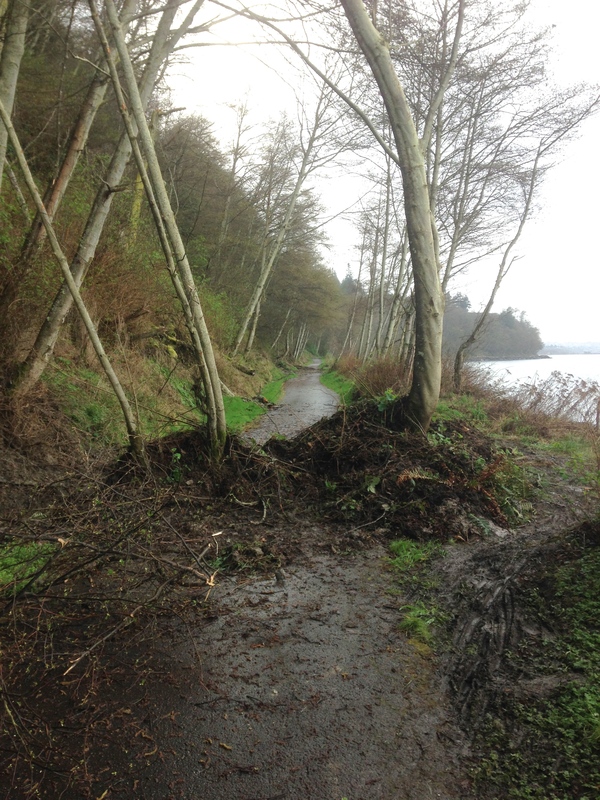 In the next town to the east, a river jumped its banks and partially destroyed a pedestrian bridge, rendering that section of the trail impassible. When we ride our bikes over that way, we have to take a long detour on a busy road. Closer to home, the section of the trail that I use most often runs for nearly three miles at the base of an extremely unstable bluff. We’ve had mudslide after mudslide. Our city does a good job of cleaning the debris off the trail, but on any given day there might be one to several new slides. This makes planning a run of a specific distance difficult because I never know how far out along the trail I’ll be able to run before being forced to turn back. I usually end up doing a lot of short out-and-backs between slides to get the distance I want. Last Friday, because I was walking, I didn’t mind the slides. Rather than turn back, I carefully ventured across a couple of them, all the while with a careful eye turned to the bluff above me for signs of new movement. This is a typical sight: a couple of shallow-rooted alders will just sort of walk down the bluff and come to rest astride the trail. This type of slide I can easily detour around. The mud flows are more annoying. This one was about 20 yards long and a couple of feet deep in places. It’s tough to cross this type of slide without getting my feet muddy and/or wet. 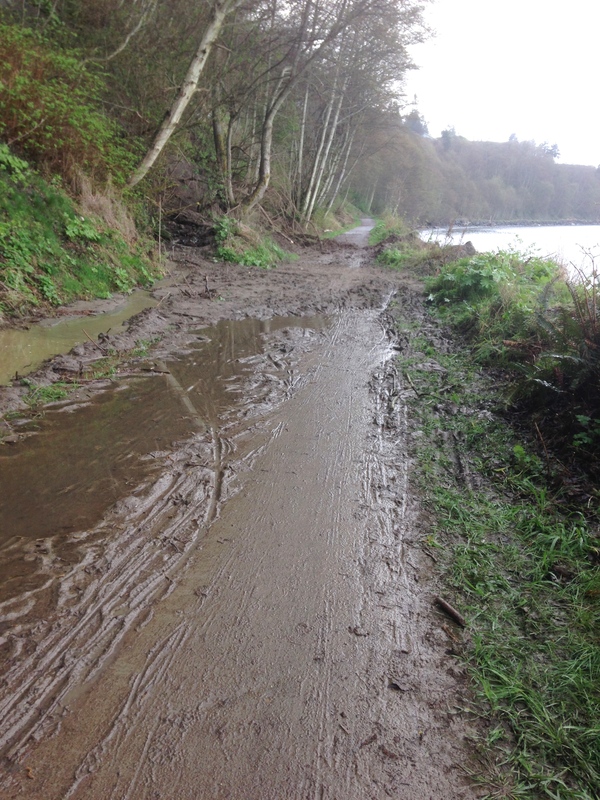 Hence while I’m delighted that spring is here, I’m eager for warmer, sunnier weather to dry out that bluff and improve conditions on the trail. I’m running a half marathon here only eleven weeks from now! Meanwhile, I’m content to watch and catalogue the ongoing signs of spring. Yesterday dozens of turkey vultures flew overhead. They and hundreds more are gathering just west of here. One day soon, the winds will be just right and they’ll all make the big flight across the strait to Vancouver Island and beyond. And soon enough, it will be summer again. What about you? Are you noticing signs of spring in your part of the world? I hope you have many chances to get out there and enjoy it. Slow and happy!